Prior to this year, the last time Dylan and Tyler Sikura took the ice together was on their high school junior varsity team. The brothers seized an opportunity to play together the one year they could, when Dylan was in ninth grade and Tyler was in twelfth. That year it was just for fun. When the two donned Chicago Blackhawks sweaters for a preseason game on Sept. 21 in Ottawa, the stakes were a little higher. Not only did the brothers get to experience their hockey reunion while representing one of the sport’s most historic franchises, they did so on the same line. “The first preseason game that we got to play together was something that neither of us or, our family, will ever forget,” Dylan said. Over the past month, the two have had the chance to consistently play together with the Rockford IceHogs. Now that their paths have converged, the brothers are enjoying both the sentimentality of this unique opportunity and its tangible benefits at this point in their respective careers. The Sikruas’ on-ice chemistry was apparent almost instantly. Though IceHogs head coach Jeremy Colliton does not have the brothers on the same 5-on-5 line, he has weaponized them in a different way: on the power play. In the brothers’ second professional game together, a matchup on Oct. 6 against the Cleveland Monsters, the two connected on a goal for the first time since junior varsity. With the IceHogs a man up, Dylan possessed the puck on the half-wall and fired a centering feed to Tyler camped in front of the net, who redirected the pass into the twine. That connection wasn’t just a moment for the Sikura family scrapbook. It was the beginning of a major cog in the overall effectiveness of the Rockford man-advantage. 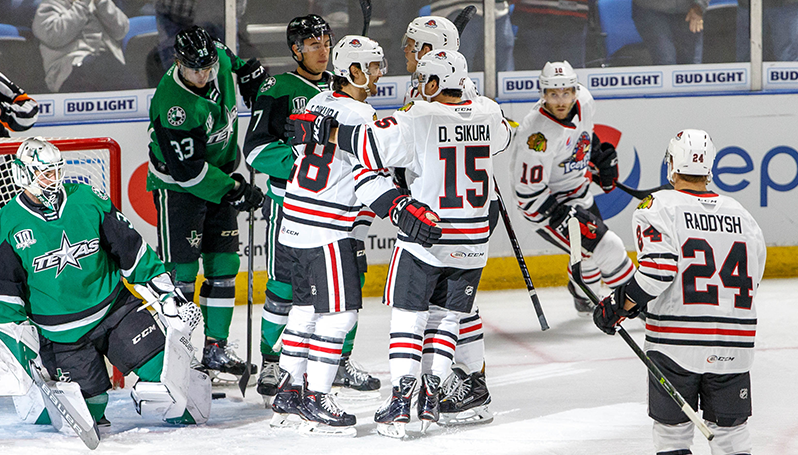 The routine of Dylan dishing from the half-wall to Tyler in front of the net has become a go-to play on the IceHogs top power-play unit. “I think it’s a matter of recognizing when the right time to do it is and when you can make the defense shift and move the box so that I can be open,” Tyler said of the strategy. On paper, it’s easy to see why Dylan and Tyler are capable of such instinctual plays, even without accounting for the brotherly bond. Tyler was voted Team MVP by his IceHogs teammates after the 2017-18 season, while Dylan spent the campaign with Northeastern University where he was a finalist for the Hobey Baker Award. Dylan and Tyler are talented players, and it should come as no surprise that two talented players are able to produce when deployed together. But it’s difficult to ignore the effect that years of passing the puck around in the garage and watching one another compete at every level has when the brothers are out there together. But the benefits of this Rockford reunion extend far beyond the IceHogs’ power-play percentage. For Dylan, a 23 -year-old rookie transitioning from collegiate hockey to his professional career, and life as a college student to life as an adult, Tyler is an invaluable mentor who has been at his side every step of the way. Tyler understands Dylan’s transition as well as anyone because he has experienced it himself. Dylan had a brief stint in Chicago after concluding his final season at Northeastern, but is now getting his first taste of the trials and tribulations of a full professional campaign. Much like his younger brother, Tyler made his pro debut the same year his NCAA career came to a close, and then spent the entirety of the following season in the pros. If the stat sheet is to be believed, Tyler has helped his brother find this effort level quite effectively. Dylan leads all Rockford skaters with 10 points, tied for the fifth-highest total of any AHL rookie. The early-season outburst has earned Dylan consideration as a blue-chip NHL prospect and given him perhaps the even more elusive commodity of an older sibling’s praise. Tyler’s memories from playing on the pond in the brothers’ hometown of Aurora, Ontario characterizes a theme that has stuck with them everywhere the two have played together, from the garage to their high school JV team all the way up to professional hockey. A story of two gifted players mutually growing one other’s arsenal of skills. Now in the thick of the season, the brothers’ time together may feel a bit more habitual then novel. Though the focus is more on winning hockey games than making memories, the memories are still unavoidable, natural and permanent.